Prior to 1966, Normal did not have a Catholic parish. On June 8 of that year, Bishop John Franz announced the establishment of Epiphany Catholic Church. A building fund campaign two years earlier funded the construction of an eight-classroom school, rectory, and convent on what had been farm property purchased by the Diocese of Peoria. Father John King, assistant pastor at Holy Trinity Parish in Bloomington, was named pastor. Four Franciscan Sisters from Peoria, along with two lay teachers, were engaged to staff the school. Masses were held in the school cafeteria prior to completion of the church which was dedicated on March, 27, 1973. With the retirement of Father King in 1995, Rev. Thomas Maloney, a former Epiphany assistant pastor, was named pastor by Bishop John Myers. Monsignor Maloney retired in 2002 and Monsignor Eric Powell became the parish's third and current pastor. In 1997, an addition to the school that included four new classrooms, a library/computer lab, and a parish multi-purpose room was completed. The Lyceum was built in 2000, adding a gymnasium and six junior high classrooms. In 2005, plans for updating and restructuring of the original church were set in motion by the Long Range Planning Committee. After a fund drive, construction began after Easter in 2009, with Masses moving back to the school cafeteria and Lyceum. Doors to the renewed church opened on July 10, 2010. The original parish had 400 families. Presently over 1400 families are served by Epiphany Catholic Church. Epiphany School offers classes from three-year-old pre-school through eighth grade. The growth of our parish is the result of a spirit of cooperation and generosity from a faith-filled community of great people! The overall project design theme of "Noble Simplicity" was followed using forms and primary materials which were intended to be both practical and durable. Another goal was to evoke an overall Church character image of "timelessness and permanence" with symbols of our Faith being incorporated where appropriate and practical to do so. There were several churches having influence and inspiration on the design. Having reached back into Roman antiquity for simplicity of form, one stands out with regard to the central façade: Santi Vincenzo e Anastasio, Rome. The central piazza and flanking wings of the building for the parish hall and early learning center as well as the stone wing-walls on each side of the main entrance portal are humble references to Bernini's great square at St. Peter's, Rome (Piazza San Pietro) with the "maternal arms of Mother Church" reaching out to bring souls to Christ. The use of a series of arched windows is a reference to the ancient loggia and colonnades used to support various church structures or enclose monastic courtyards, evoking a sense of tradition. Consider these arches as architectural images of the Holy Ones -- saints, angels, priests and religious -- as sentinels standing guard to help protect us against evils and to serve and guide the Church and lead souls to Heaven. An interweaving carving was incorporated on the face of each of the corbels which support the Altar. This detail is intended to symbolize the True Vine (Christ) while the continual, repeating pattern symbolizes the Eternal and Infinite Love of Christ. More contemporary references identify this sort of pattern as a "guilloche" design. The use of stars in the project is direct reference to the Epiphany. These stars shine forth the revelation of God to mankind in human form in the person of Jesus Christ. The eight-pointed star and octagon represent the Eighth Day of Creation as found in numerous ancient churches. The marble floor patterns were inspired by variations on patterns found in both the basilica of St. Francis and Santa Maria deli Angeli, Assisi. The marble reredos walls at both the church and chapel were inspired by several churches. There was a desire that the image of these walls would visually tie together these elements with the main entrance portal. The six niches were incorporated on each side of the apse in reference to the Twelve Apostles -- again, another ancient tradition found in many churches. Lastly, the Adoration Chapel was conceptually envisioned as a "grotto," with reference to places such as Lourdes, with the more rough-hewn perimeter walls giving way to the polished stone marble at the focal reredos and the magnificent glory of the Blessed Sacrament enshrined there. Mazzolini Artcraft Co., of Cleveland, Ohio, designed and supplied the finished marble liturgical furnishings including the main altar of sacrifice, ambo, baptismal font, the monstrance shelf in the Adoration Chapel and bases for the church tabernacle, paschal candle and three statues. These pieces were executed in "Epiphany Red" marble using raw blocks quarried in Central Asia specifically for this project. The marble was then cut, carved and fabricated by craftsmen in Pietrasanta, located in the Carrara region of Tuscany, Italy. The finished marble work was installed by the award-winning installation crew from Mazzolini Artcraft Co.
Twin City Tile and Marble Company from St. Paul, Minnesota supplied the marble for the floors and walls of our renewed church. This marble is installed in the baptistery, sanctuary and adoration chapel and consisted of five colors selected by Monsignor Powell and the architects from Larson and Darby. After the drawings were developed and approved, ItalMarble Pocai from Massa, Italy cut and polished the stone. The stone pieces were crated and loaded in two ocean containers and shipped to the Port of Montreal and subsequently traveled by rail to Chicago. From there, they were delivered to the jobsite and installed by a team of craftsmen from Minneapolis-St. Paul, Lacrosse, Wisconsin, and Central Illinois. Located to the left of the altar, the Blessed Virgin is portrayed standing with her right hand raised in blessing, concern, and love. Mary's left hand rests on her womb, her pregnancy emphasized by her sash. In her maternal role, she blesses all of her children -- all Christ's faithful who draw close to her. This bronze was created by Jerry McKenna, a citizen of both the United States and Ireland, and has lived in Texas for over forty years. In the apse behind the tabernacle is a custom reproduction of "The Adoration of the Magi" by Bartolome Esteban Murillo (Toledo Museum of Art, Toledo, Ohio). 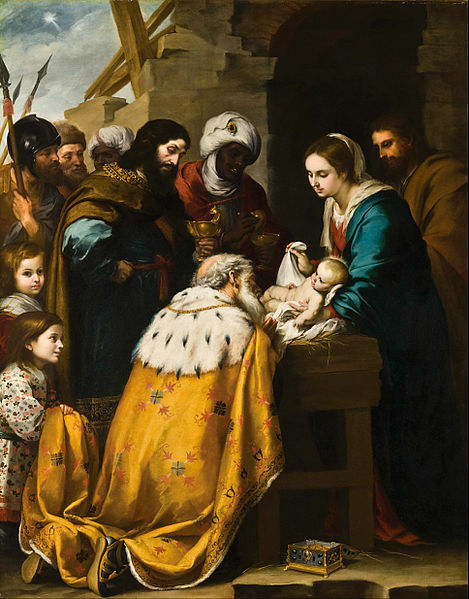 It was selected for obvious references to the Epiphany and as an inspirational piece to invoke people to worship and pray to Christ as humble servants, no matter their state in life. It was painted by Neilson Carlin of Kennett Square, Pennsylvania. Christ and his earthly foster father are depicted during a moment's rest in the workplace. Joseph carries a hammer in his left hand while other elements of his carpenter's trade are visible. His eyes and strong arm are on Jesus, underscoring his devotion and role in Christ's early formation. Accomplished artist Rip Caswell was commissioned to sculpt the life-size depiction of the baptism of Christ. His work is at times contemporary and sometimes realistic in style, but always displaying a deep understanding of living creatures -- human and animal -- in their natural environment. His sculptures have a life and breath of their own. In describing his inspiration for Epiphany's sculpture, Caswell explains, "The life size figure depicts an accepting Christ as he bows his head in receipt of the blessing. John the Baptist stands over him, one hand pouring the baptizing water while the other is raised to the heavens imploring God to grant the blessing. "The base of this sculpture holds many hidden clues to the life and time of Christ. Inlaid in the water of the base are actual stones from the Jordan River. In addition to the rocks, there are several spiritual and symbolic elements including a snake being stepped on and controlled by Christ and an olive branch flourishing behind John the Baptist." In the Parish Hall is displayed Chamizo's version of "The Communion of the Apostles" by James Jacques Joseph Tissot, Brooklyn Museum, Brooklyn, New York. The existing Stations of the Cross were cleaned and touched-up and set in new decorative frames. This work was executed by Heritage Restoration of Peoria. In the Sacristy, Chamizo's copy of Titian's "Ecco Homo", Museo del Prado, Madrid Spain. The corpus of our original Oberammergau Crucifix (CA. 1968) was skillfully reworked by Heritage Restoration of Peoria and placed on a new cross. It now hangs in the Parish Hall lifting our eyes to Heaven. The Resurrection (CA. 1640-1650) displayed in the Adoration Chapel is an oil on canvas by Matteo Rosselli (Florentine, 1578-1650). This piece was frequently displayed in the Denver Art Museum between 1985-2004. The Good Deeds Trust purchased the painting from the Mayer collection for exhibit at Epiphany. On the ceiling of the Adoration Chapel is a fresco developed and executed by Neilson Carlin and was intended to further lift one's eyes and heart toward heaven with the centerpiece being an image of the Coronation of Our Lady as Queen of Heaven. There are two tabernacles in the Adoration Chapel. Both have the same design -- one is silver plate and the other in enamel panels, inspired by 12th century altar fronts. Both are accented by celtic filigree ornamentation. Scenes depict the Annunciation, Nativity, Visit of the Magi, flight into Egypt and Christ enthroned in glory with the Greek letters "alpha" and "omega" to his left and right. 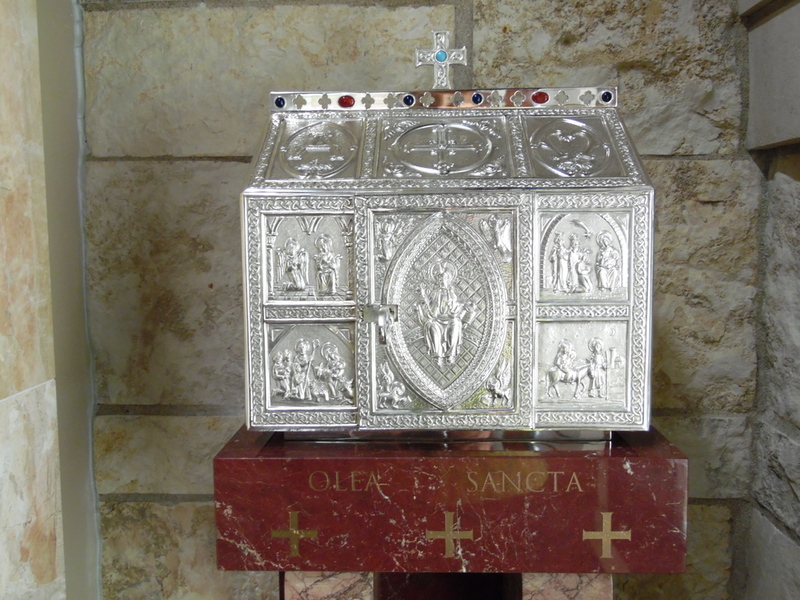 The tabernacle in church is a large Mozarabic style tabernacle (Spanish influence) inspired by the agate box from San Isidoro de Leon (11th century). It too depicts scenes in the life of Christ (eg. Annunciation and Visit of the Magi) with the central panel (on the tabernacle door) depicting the Christ child on the lap of his mother. Translucent veils, in the Church's liturgical colors, are used to cover this tabernacle and highlight to the faithful the season or saint being celebrated on any given day. The original church stained glass windows were cleaned and new clear glass protective panes were installed on the exterior face to replace all the broken panes. New screens were also provided to replace the originals. The windows in the Pope John Paul II Adoration Chapel and the Cenacle were made by Conrad Schmitt Studios of New Berlin, WI. The main outside window in the chapel is of "Our Lady of Guadalupe" and St. Juan Diego. In 1999, Pope John Paul II in his Exhortation Ecclesia in America declared "Our Lady of Guadalupe" as the patroness of all America. The main inner window displays Pope John Paul II's coat of arms. The window in the Cenacle has the coat of arms of Bishop Jenky. 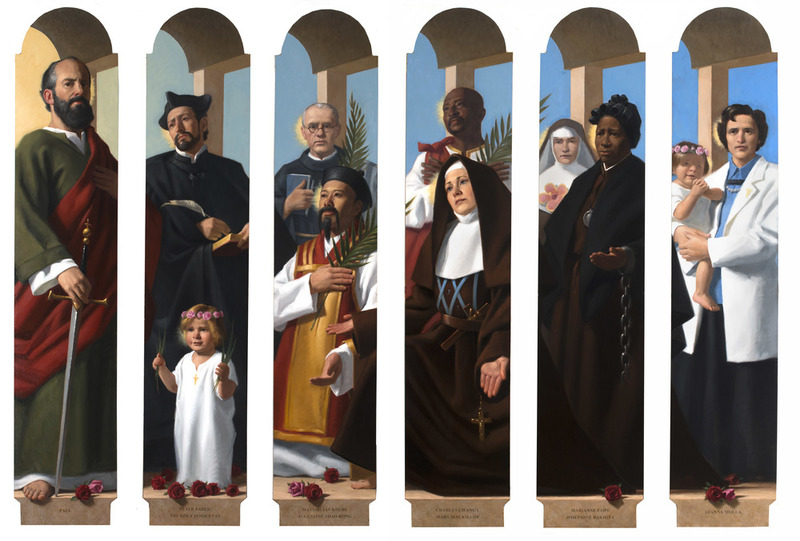 Neilson Carlin’s newest paintings depict saints from the time of Christ (St. Peter and St. Paul) to the modern era (St. Gianna Molla and St. John Paul II), spanning 2,000 years and six continents. While some are familiar, such as World War II Nazi death camp martyr St. Maximilian Kolbe or St. Therese of Lisieux, others including St. Lorenzo Ruiz, the first Filipino saint, or St. Alphonsa Mattathupadathu, the first woman of Indian origin to canonized, may not be as well known locally. “We have parishioners from India, Africa, Latinos, so we wanted to rope in the world instead of anyone’s particular favorite saints from Europe,” said Msgr. Eric Powell, pastor, who collaborated with Carlin on the project. By design, the paintings move outward from the altar chronologically — from the pillars of the church, St. Peter and St. Paul, to the modern saints at the edges “until you transition to the future saints in this church,” said Carlin with a nod toward the students seated in the pews. Right Side (L to R): Paul, Peter Faber, Holy Innocents, Maximilian Kolbe, Augustine Zhao Rong, Charles Lwanga, Mary MacKillop, Marianne Cope, Josephine Bakhita, and Gianna Molla and Holy Innocent. More information about the artist can be found on his website: neilsoncarlin.com. In Epiphany's altar, a number of relics are preserved and serve as inspiration for the faithful of the parish and community. They include a piece of the True Cross, St. Rita of Cascia, St. Josemaria Escriva, St. Teresa of Avila, St. Maria Goretti, St. Pudentiana and Sts. Charles Lwanga and Matthew Molumba. The Code of Canon Law states, "The ancient tradition of keeping the relics of martyrs and other saints under a fixed altar is to be preserved...a widespread practice since the fourth century. In all, relics remind us of the holiness of a saint and his cooperation in God's work. At the same time, relics inspire us to ask for the prayers of that saint and to beg the grace of God to live the same kind of faith-filled life."